Why should I bundle a report writer with our product? How would the bundling arrangement work? What work would be involved on our end? Would adding 4GL custom reporting really help us increase our sales and lower our costs? Many established mainframe products still come with a cumbersome, archaic report writer (if they provide for custom reporting at all.) Often it's a "kluge" solution hastily thrown together years ago when early customers complained that they couldn't customize the standard reports. Including a modern 4GL report writer and PC-export utility could be just what it takes to make your product soar above its competition. It lets your prospective customers get exactly what they want during their product trial. And it lets your salesmen say "yes" when the prospect asks if it's easy to change the reports. You would be licensed to distribute a customized OEM version of our 4GL report writer (Spectrum Writer) with your product. The report writer will run under the name of your choice, as a part of your system. It will be our full-featured product, with no functions disabled. The only restriction will be that it can only report on your product's files. (That is, it will not serve as a general purpose report writer for other files in the customer's shop.) Your license fees to us will be on a sliding scale based on volume, going as low as just $995 per copy. You are free to charge your customers whatever you like for this new "report writer option," recuperating the fee, or even making a profit on each copy. Or you may decide it's best to include it "for free" to help close more sales. That's up to you. Perhaps this sounds interesting enough to investigate further. But you may feel reluctant to make a phone call and risk being hassled or pitched. I understand the feeling. That's why I encourage you to first examine the technical possibilities all on your own. Download a free 30-day trial of the report writer directly from this site. It installs easily in under half an hour. Let your technical staff experiment with it. Check out the quality of the full documentation. See how easy it is to use, and how well it works with your product's file system. When you would like to discuss it further, or if you have any questions, please feel free to contact us. We look forward to the possibility of discussing with you a mutually beneficial business relationship. Read what the President of one software company (which has bundled Spectrum Writer since 1992) wrote about his experience. Then decide for yourself! "Spectrum Writer has turned out to be everything we hoped it would be. In fact, I can honestly say it has exceeded our initial expectations. 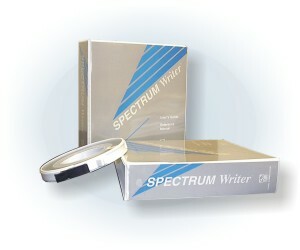 "Our customers are very pleased with Spectrum Writer. Many of them have complimented us on "our" Report Writer. They say it is easy to use and powerful enough to do almost anything they could want. "The bottom line: bundling Spectrum Writer with our product has helped us increase sales, profits and customer satisfaction. 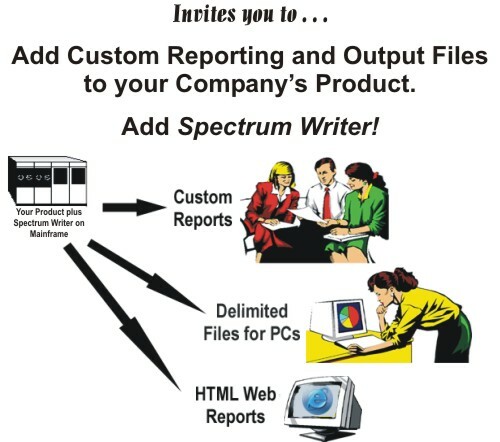 Furthermore, it has freed up our technical staff from maintaining our old reporting programs and allowed them to create new and exciting reports with Spectrum Writer."